Don't forget to give our live chat option a go if you would like immediate assistance during our normal business hours. Thank you. CIP Office Technology has been providing industry leading wide-format, MFP, copier, and imaging solutions since 1981. Combining high-speed A1 printing up to 9 prints per minute with high-speed scanning, the compact Teriostar 2060 Series large-format printer supports various data formats and is designed to streamline workflow. 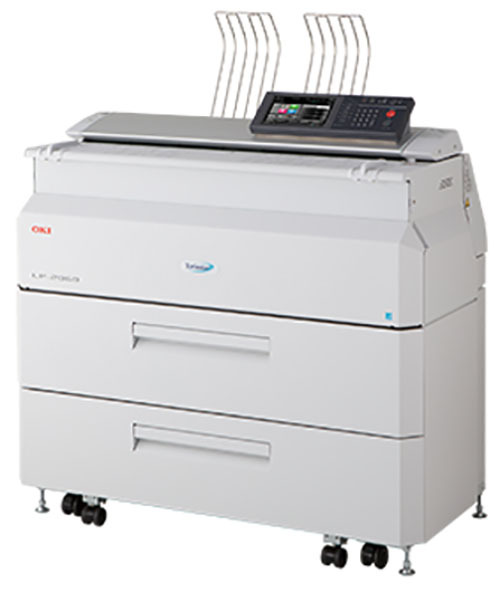 The high-performance Teriostar 2060 Series large-format printer combines high-speed printing and scanning with a compact design. The Teriostar LP-2060-MF is ideal for shared business printing in the AEC industry, a long print length, workflow control software, easy-to-use colour LCD touchscreen panel and security features help boost productivity, maximise uptime and protect data and documents. Fitting into much smaller spaces than other large-format printers, the compact design makes the Teriostar LP-2060-MF ideal for shared use. The user-replaceable consumables help maximise productivity and device uptime. Aimed at improving productivity while providing a range of business-oriented functions and features, the Teriostar LP-2060-MF eliminates the need to manually change roll paper settings, saving time. An easy-to-use colour LCD touchscreen panel provides visibility and guidance while security features and in-built storage make it easy to save and protect documents. Ideal for busy workgroups in the AEC industry, the Teriostar LP-2060-MF features a range of software functions to streamline workflow including the option to scan directly to a TIFF or PDF file and convert to other formats including BMP for archiving drawings. The Teriostar LP-2060-MF features a high-performance print engine and scanner, delivering super-fast A1 print speeds up to 9 prints per minute (ppm). Reach out to a specialists for a free consult. When you deal with us you deal with a simple process that takes all the guesswork out of what type of device you need. In just 3 simple steps you can have your new equipment on the way! When you're ready to get started just jump on the phone or start a chat with one of our product specialists and they'll help you find the right product for your needs. After you've placed your order, but often at the same time, we'll schedule a time with you to have your new equipment installed in your office space. We don't stop helping you just because your order has been placed. We'll take the extra step and setup device training for you and your staff. Don't miss out on latest industry news, featured products, special events, and amazing offers. We email about once a month and you can opt-out anytime with just one click. © CIP Office Technology. All Rights Reserved.